The Xinli site is on the eastern slope of Yiwulü Mountain, between Xinli 新立 and Yingtaogou 櫻桃溝 villages. The site has been surveyed and excavated between 2015 and 2018 (and investigation is still ongoing), and two large-scale tombs have been discovered, one designated M1 (84 m in length) to the southwest of the main buildings, and one designated M2 (44 m in length) to the north of the main buildings. 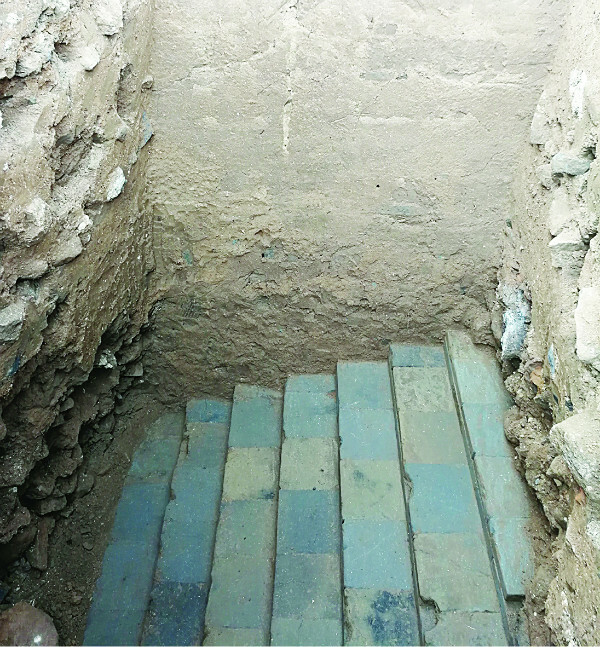 Based on the layout of the tombs and buildings, and the high quality of the artefacts discovered there, the archaeologists suggest that this was an imperial mausoleum from the Liao dynasty. The History of the Liao records that two imperial mausoleums were built on Yiwulü Mountain: Xianling 顯陵 mausoleum and Qianling 乾陵 mausoleum. Xianling mausoleum was constructed in 947 for Yelü Bei 耶律倍 (899‑937), who was the eldest son of the first Liao emperor, Abaoji, and King of Dongdan. Although Yelü Bei had been proclaimed crown prince, because he preferred reading and painting to hunting and fighting, when his father died in 926 his younger brother was put on the throne instead of him, and Yelü Bei went into exile. In 947, when Yelü Bei's son became Emperor Shizong, Yelü Bei's body was returned to Liao, and because he had loved Yiwulü Mountain so much when he was alive, Emperor Shizong built a mausoleum for him here. When Emperor Shizong died in 951, he too was buried on Yiwulü Mountain, at a location called West Mountain. No mausoleum name is recorded for Shizong's burial place, so it may have been considered to be part of the Xianling mausoleum. Qianling mausoleum was constructed in 983 for Emperor Jingzong of Liao (r. 969–982). His consort, later known as Empress Dowager Chengtian, was also buried at Qianling when she died. According to History of the Liao, the last emperor (r. 1101–1125) died of natural causes in Jin custody 1128, and in 1145 he was buried next to the Qianling mausoleum (the History of the Song tells a different and not very believable story that he was killed in 1156 after a polo match to the death with the deposed last emperor of Song). All the other Liao emperors were buried much further north, in modern Bairin Left Banner and Bairin Right Banner in Inner Mongolia, as shown in the map below, so any imperial tomb discovered at Yiwulü Mountain must be either Xianling or Qianling. Zuling mausoleum 祖陵 (purple): Emperor (I) Taizu 太祖 (Abaoji, r. 916–926). Huailing Mausoleum 懷陵 (green): Emperor (II) Taizong 太宗 (r. 927–947); Emperor (IV) Muzong 穆宗 (r. 951–969). Xianling Mausoleum 顯陵 (orange): Emperor (III) Shizong 世宗 (r. 947–951). Qianling Mausoleum 乾陵 (blue): Emperor (V) Jingzong 景宗 (r. 969–982); Emperor (IX) Tianzuo 天祚帝 (r. 1101–1125, d. 1128, buried 1145). Qingling Mausoleum 慶陵 (yellow): Emperor (VI) Shengzong 聖宗 (r. 982–1031); Emperor (VII) Xingzong 興宗 (r. 1031–1055); Emperor (VIII) Daozong 道宗 (r. 1055–1101). 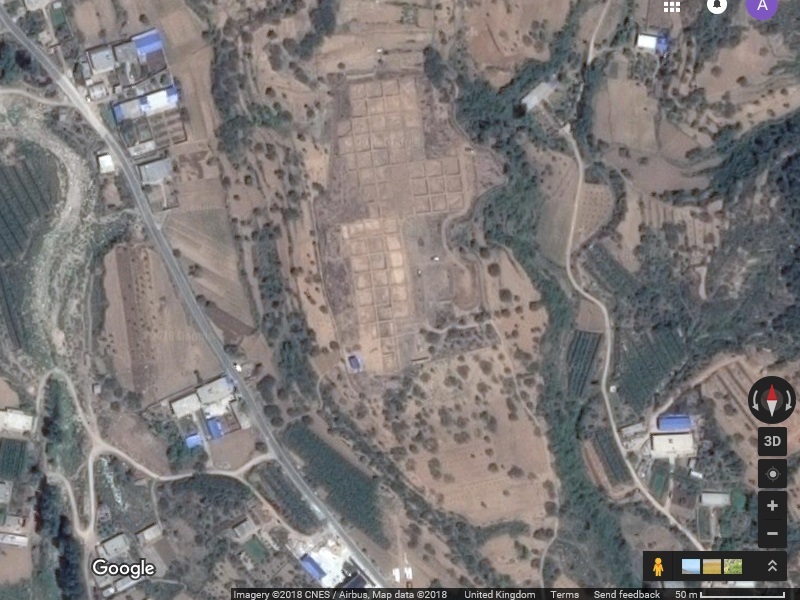 The authors of the report on the excavation state that the Xinli site is similar in layout to the Qingling mausoleum where the 6th through 8th emperors were buried, but not similar to the Zuling and Huailing mausoleums where the 1st, 2nd and 4th emperors were buried. For this reason, they suggest that the occupant of the tomb site at Xinli would more likely be the 5th emperor (Jingzong) than the 3rd emperor (Shizong), and therefore the site should be that of the Qianling mausoleum. The fact that the Xinli site contains two large tombs fits with this identification as it is recorded that Emperor Jingzong and his consort were separately buried there. The tomb M2 at the north should be that of Emperor Jingzong, and the tomb M1 to the southwest should be that of Empress Dowager Chengtian. It is also recorded that the last emperor was eventually buried at Qianling, twenty years after the fall of the Liao, but it is unlikely that a magnificent new tomb would have been constructed for a deposed emperor, so he was probably buried in a simple grave. The only way to be certain of who is buried in the tombs at the Xinli site is if written evidence can be found there, especially epitaphs inscribed on stone that are normally found in imperial or aristocratic tombs of the Liao dynasty. The tombs M1 and M2 have not yet been opened up, but already some important finds have been made on the site. In particular, a number of fragmentary pieces of jade slips with engraved text have been found on the site of the main hall south of Tomb M2. The slips have holes in them, apparently so that they could be bound together as a "book", imitating the bamboo books of ancient times. What is most exciting is that some of the jade slips are engraved with Chinese text, and others are engraved with Khitan Small Script text. The number of jade slips found has not been made public yet, but as jade is a very durable material, there should be a good chance that the complete jade books can be reconstructed. And if the Chinese and Khitan versions are a direct translation they would be very important in advancing the decipherment of Khitan Small Script. Even if the two versions are not translations (which is frequently the case with pairs of Chinese and Khitan epitaphs), the Khitan slips will provide invaluable new data for understanding Khitan Small Script and the Khitan language. The Khitan language was written using two completely different and mutually exclusive scripts, Khitan Large Script [KLS] and Khitan Small Script [KSS] (see The Mystery of Two Khitan Scripts). The use of these two scripts overlapped both geographically and chronologically, and both were used for writing epitaphs and monuments (about 15 KLS and 40 KSS monumental inscriptions are known), so it is difficult to determine when, where and by whom each script was used. 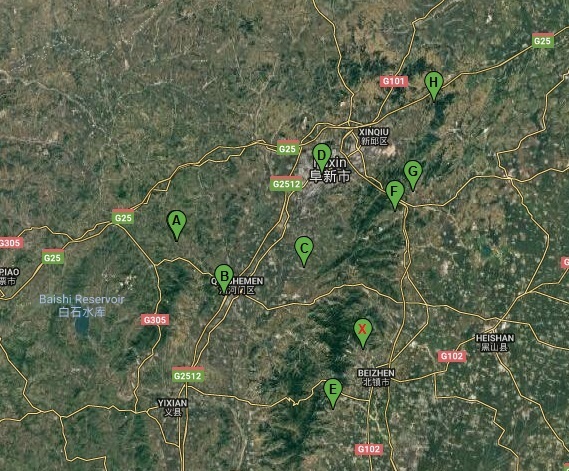 However, a cluster of at least eight Khitan Small Script epitaphs have been found in Liao dynasty tombs on or near Yiwulü Mountain (which is not a single peak, but a mountainous ridge, running northeast to southwest, up to a 100 km in length), whereas not a single Khitan Large Script inscription is known from the area. 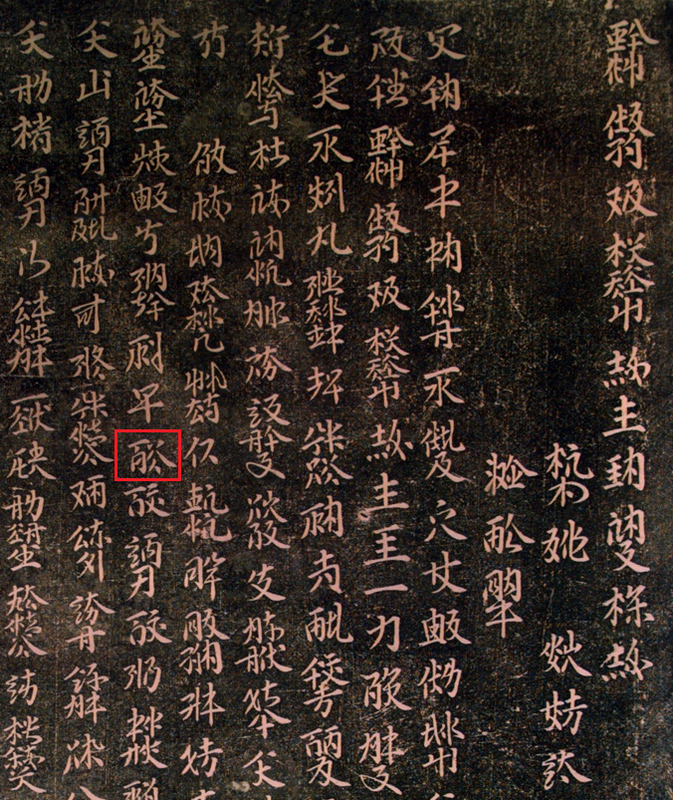 It is therefore no surprise that the jade slips at Xinli are engraved in Khitan Small Script rather than Khitan Large Script. Other KSS epitaphs of unknown provenience may also come from this area. For example, the Epitaph for Xiao Hudujin 萧胡睹堇 (1091), held at the private Khitan Museum in Bairin Left Banner, and the Epitaph for Xiao Dilu 蕭敵魯 (1114), held at the Ethnic Museum of Inner Mongolia University, may both have been taken from robbed tombs in this area because Xiao Hudujin and Xiao Dilu are close relatives of Xiao Tuguci [D] (Xiao Hudujin is a nephew of Xiao Tuguci, and Xiao Dilu is a nephew of Xiao Hudujin). As far as I know, this is the only publicly available photograph of the jade slips found at the Xinli site. 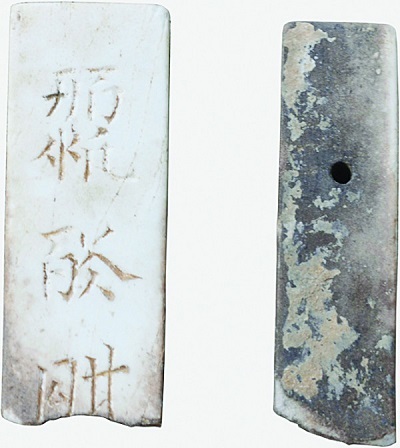 The left piece shows an inscription in the Khitan Small Script, and the right piece shows the back (I assume) of another slip, with a hole for binding the pieces together. I am looking forward to being able to study the full set of inscribed jade slips when they are published, but in the meantime here is a brief analysis of the short Khitan Small Script inscription on the left piece (with thanks to Viacheslav Zaytsev for some suggestions). Characters occuring in isolation are logographic, and generally have a known meaning but an unknown or guessed reading (examples of logographic KSS characters include numbers and calendrical terms). By convention, when transcribing a logographic character, its English meaning is given in all capitals. Characters which combine together to form blocks (or polygrams) of between two and eight characters are phonographic, with each character having a relatively fixed phonetic value (the actual phonetic value may depend on the surrounding letters, for example a letter could be syllabic "le" or "el" in some contexts or just the consonant "l" in other contexts). The approximate phonetic values of some characters are known, but some readings are little more than guesses, and many readings remain completely unknown. The polygram is read from left to right and top to bottom, with the characters combining together to spell a single word of one or more syllables (often a stem on which a range of suffixes may be appended). By convention, when transcribing a polygram, dots are used to separate the phonetic values of individual characters. See this list of readings and meanings of KSS characters from Daniel Kane's The Kitan Language and Script (Brill, 2009). For further information on the Khitan Small Script, and its proposed encoding in Unicode take a look at this document by myself and Viacheslav Zaytsev. Khitan Small Script is scheduled for inclusion in Unicode version 13.0 in March 2020, and at that time I will modify this blog post to use Unicode KSS characters. In the case of this fragment, there are three polygrams, the first comprising four characters, the second comprising two characters, and the third comprising two characters. The bottom of the third block is broken off, but we can be sure that there are no more than two characters in this block because of their tallness — if it was a block of three or more characters then the first two characters would be stunted, as is the case for the first block. The inscription is transcribed in the table below, with the polygraphs reformatted into horizontal layout. 137 is conventionally transcribed as ren because it looks like the Chinese character 刄 rèn, but its actual phonetic value is unknown, so I transcribe it with a question mark. 261 has a phonetic range of [l] ~ [el] ~ [le]. The final two characters of the first word [261-334] -[e]l.gi are the feminine form of the causative suffix, corresponding to the maculine form [098-151] -[a]l.hu. These two sufixes are cognate with the Mongolian causative suffixes -lge ᠊ᠯᠭᠡ and -lɣa ᠊ᠯᠭᠠ. The second word, [021-341] mó.er is the common Khitan word for "mother, wife, woman, lady", which frequently occurs in KSS epitaphs. The third word, [307-080] ?.ii is a frequently found word, but its reading and meaning are currently unknown. We cannot hope to make much sense of a small fragment like this, but it is far from as hopeless is it might have been. Although we have not been lucky enough recognise a name or date on this fragment, we can at least read and understand the middle word mó.er. I very much hope that the rest of the jade slips found at the Xinli site will be published soon!